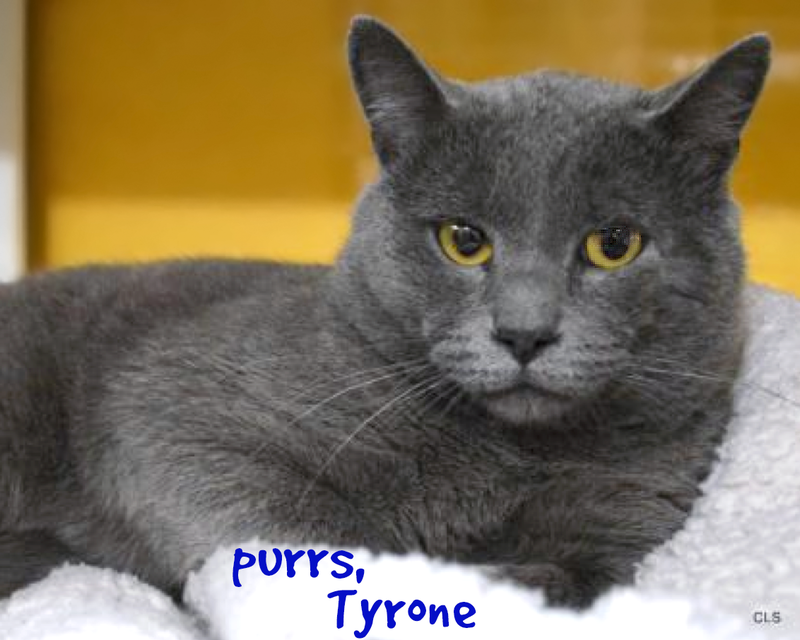 "I'm Tyrone, a beautiful deep gray or "blue" shorthaired boy with gorgeous golden eyes." "I came to Wayside as a stray. I'm a sweet boy, but I'm pretty shy. However, if you speak to me softly and pet me gently, I will warm up quickly. One way I communicate how much I enjoy being petted is by blinking my eyes. I also have a great meow. People here at Wayside say I'm gradually coming out of my shell. A lot of times the most awesome kitties are the ones who just need a little help feeling safe, loved and comfortable. Once we get it, our wonderful, loving purrsonalities come shining through. Felineality-wise, I'm a Private Investigator. That means I tend to be timid in new situations. I like to check out new people and places first instead of just diving right in with all four paws. There's one more thing you should know about me: I'm FIV-postive. It's not as scary as it sounds. It just means that my immune system is somewhat compromised, so it's important for me to have annual veterinary checkups and, if I do get sick, that I get veterinary care. If you are interested in me and would like to learn more about FIV, watch my video! Or one of our great veterinary staff members here at Wayside can answer any questions you may have. Do you have room in your home and heart for a shy, sweet, beautiful boy kitty? Please come to Wayside and meet me. Tyrone is available for adoption at Allie's Alma Mater, Wayside Waifs! Tyrone, you are very handsome! Good luck to sweet Tyrone. Have a wonderful Wednesday. Hoping sweet Tyrone finds his perfect forever home. Awww what a handsome cat Tyrone is ! Best Fishes Tyrone! Someone needs a sweet and quiet kitty. Tyrone is gorgeous! The head peep has a soft spot for blue kitties, and all of us are purring that Tyrone founds a pawesome home where he gets the time to come out of his shell and let his personality show. Tyrone you are one handsome Mancat! Paws and fingers crossed for you dear boy!